Description of "99 KITCHEN DELIGHT"
This Cook Book” 99 Kitchen Delight” is the result of my Creativity and Passion towards Food and Cooking. I have converted all my Cooking skills and Passion in to simple and understandable format which will reflect in each chapter of the Book. The Dishes mentioned in the Book “99 Kitchen Delight” will help every Working and Non-Working Women and Men across the world. This Book is also helpful for Housewife & Newly Married Girl and who is new to kitchen and also for the People who wants to open Training Institute. This Cook Book “99 Kitchen Delight” consists of all Simple and Delicious Recipes starting from Fresh Morning Dishes to Weekday Dishes to Weekend Dishes to Refreshment & Relaxing Night Dishes including Festival and Special Holidays Dishes. This Cook Book is for Everyday Life of People from Monday to Sunday. You can Cook, Eat and Serve the Delicious and Tasty Dishes to yours family members, friends, relatives and guests. This Cook Book”99 Kitchen Delight” is a guide to making Everybody’s Cooking Life easy and pleasurable. Cook the Dishes with Love, Pleasure and Enjoy your Cooking Life. Leena Panigrahi was born in Bolangir, Odisha. Leena Panigrahi is married to Satya Sundar Brahmachari who was born in Bhubaneswar, Odisha. On a professional note, she holds an Engineering degree in Biotechnology and certified IT professional. She is also an Author by destiny and Passion to write. Her hobbies include Cooking, Writing and Travelling. Slowly and steadily, she has started to put down her thoughts in writing Books on new trends that can make a difference in normal people lives. Leena Panigrahi along with Satya Sundar Brahmachari are Pioneer Authors of recently published Book ”Todays Engineer & MBA to Tomorrows Future Leader”. 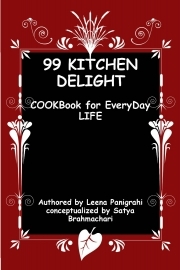 Reviews of "99 KITCHEN DELIGHT"
I am a working woman and recently purchased the book and cooked many dishes from this book.This book is helping me a lot.Buy the book and enjoy. I bought the book recently and I have cooked 2 dishes and the dishes were really very tasty. I am very happy by having this cook book.Buy the book and enjoy. I am a house wife and recently purchased the book.I have cooked 3 dishes from weekend and 2 dishes from breakfast dishes and the dishes were mouth watering.Thanks to the Author for such a nice book. Cook Book is superb.. last week I have purchased the book.I have prepared many breakfast and lunch dishes by reading the dishes mentioned in this book.This book is helping me a lot in my Kitchen.Thanks. I am a house wife and staying in Delhi with my family, I purchased the book when I saw this in Facebook.I am very much happy of having this book.Thanks to author. This is a very good Cook Book.I bought the book recently.We all in our family love to eat new new dishes everyday,so I bought this book when I saw on Pothi. Buy the book try the recipes. Very useful cook Book.. I purchased this book on Jan,I am staying in pune with my family members.I cooked few recipes and the dishes were very delicious. Recommend to buy the book. I bought the book last month and I am staying in Bangalore with my husband.I have cooked 3 dinner dishes and the dishes were really delicious.I am very happy to having this cook book. Cook Book is Fantastic.This book has a good collection of tasty and delicious recipes.I enjoyed variety of dishes.so buy,cook and enjoy the recipes. Thanks. I am staying in Delhi with my family.I have purchased the cook book recently and cooked few recipes from weekend and weekday dishes,the dishes were mouth watering.Buy the book and once try the recipes and enjoy. I am a student and recently purchased this book and this is helping me a lot in kitchen, I am suggesting to buy this book. This Book is very useful.I have tried a few of them and they turned out really yummy. I really enjoyed cooking these items.I bought this cook book. This book is helping me a lot. Nice Cook Book.. I am a Management student and staying in Bangalore and I love to cook. when I saw this book on Pothi I purchased the book and cooked many recipes which will become so delicious.Buy and enjoy cooking. Very Helping Cook Book … I am a bachelor and recently purchased this book and this is helping me a lot in kitchen, I am suggesting to buy this book.Thanks. I am a working woman and last month purchased the book.This book is saving my time.I prepared by reading the dishes mentioned in this book.This book is helping me a lot in my Kitchen. This book has a good collection of tasty and delicious recipes.I am staying in Lucknow with my friends,purchased the book last month .I cooked many recipes and all praised a lot.Thanks. Very Nice Book.. I am a staying in Bangalore with my husband and recently bought the cook book.I love to cook new new recipes.I have cooked many dishes from weekday chapter and the dishes were very delicious. Thanks. Cook Book is superb.. last week I have purchased the book.This book is saving my time.I prepared many breakfast and lunch dishes by reading the dishes mentioned in this book.This book is helping me a lot in my Kitchen. Nice Book.. I bought this book when I saw this in Pothi and also when saw many good reviews.I am staying in Kolkata with my family members.. Recommend to buy the book. I am a house wife and recently purchased the book.I am staying in Lucknow with my family and we all love tasty food.When I saw this in pothi,i bought the book and till now I prepared many dishes from the book.Thanks. I bought this book last month, when I saw this in Pothi .I am staying in Gujarat with my family members.I cooked few recipes and the dishes were very delicious. Before 2 month I have purchased the book.I have cooked 3 dishes from weekend and breakfast and all the dishes were superb.Buy the book and cook the recipes. I bought this book when I saw this in Pothi .I am staying in Mumbai with my family members.I cooked few recipes and the dishes were very delicious. Recommend to buy the book. This Book is very nice.I really enjoyed cooking the dishes.I saw in Pothi I bought this cook book.Recommended to buy the book and cook happily. I purchased the cook book last month and this book is helping me a lot in preparing delicious dishes for my family members.Very interesting and simple dishes are there in this book. This book has a good collection of tasty and delicious recipes.I had cooked 4 dishes from weekend dishes for new year party and all praised a lot by eating the recipes.Buy,cook and enjoy the recipes. Very Helping Cook Book.. I purchased this book recently and this book is helping me a lot in kitchen,I also prepared few vegetarian dishes and both was very tasty.Very tasty recipes are there in this cook book.Buy and try the recipes. This book is really fantastic.I am a house wife and staying in Chennai and recently purchased the book.I have cooked 5 dishes from weekend and 4 dishes from refreshment and all eat the dishes happily in my family. I purchased this book and this is helping me a lot in kitchen, I am suggesting to buy this book and enjoy cooking. This cook book is superb. I purchased this book and cooked 3 dinner dishes and all in my family appreciated very much.Recommend to buy the book. Thanks a lot to Author for writing such a nice book. I am newly married and staying in Delhi,recently I purchased the book.I cooked 3 dishes from 3rd chapter and all are fantastic.Buy the book and enjoy Cooking. Thanks. I am a working woman and recently purchased the book and cooked many dishes from this book. My husband is very happy with the food I prepared .This book is helping me a lot. I bought the book recently and I cooked few refreshment dishes and the dishes were really refreshing. I am very happy by having this cook book. Thanks. This book is a nice collection of tasty and delicious recipes.I am a working in a MNC in Gurgaon and recently purchased the book.I also cooked 4 dishes from weekend dishes for a small party and all praised a lot by eating the recipes.Thanks. I have purchased the book last month.I have cooked many dishes from this book and enjoying the joy of many tasty dishes.I am recommending to buy the cook book and enjoying the feeling of tasty recipes which are inside this book. Very Helping Cook Book.. I purchased this book last month and this book is helping me a lot in kitchen,I prepared few refreshment dishes and the dishes were tasty.I like the book blog also. Thanks. This book is fantastic.Recently purchased the book.I have cooked 5 dishes from weekend and 3 from breakfast and all the dishes were superb.Buy the book and cook the recipes and enjoy. I bought the book recently and I have cooked 2 dinner dishes and the dishes were really very tasty. I am very happy by having this cook book.Nice collection of recipes are there in this book.I recommend to buy the book and enjoy. I am a working woman and last week purchased the book.This book is saving my time.I prepared by reading the dishes mentioned in this book.This book is helping me a lot in my Kitchen. This book has a good collection of tasty and delicious recipes.I am a House wife and staying in Delhi,purchased the book last month .I cooked many recipes and all my family members praised a lot. Buy and cook the recipes. Thanks. I am a Hotel Management student and staying in Bangalore and I love to cook. when I saw this book on Pothi I purchased the book and I have cooked 3 weekday dishes and the dishes were really very tasty and delicious.Buy and enjoy. This Book is very useful.I have tried a few of them and they turned out really yummy. I really enjoyed cooking these items.I have a Cooking training Institute in Mumbai and when I saw in Pothi I bought this cook book. This book is helping me a lot in my Training Classes. This cook book is superb. I have purchased this book recently and gifted to my sister who is newly married and staying in Delhi.she was very happy by seeing the book as she is newly married and cooking new new items.She had cooked 4-5 dishes and all in her family appreciated her very much. I am a Punjabi and staying in Punjab with my family.My passion is cooking and all in my family are very fond of food.I have purchased the cook book recently and cooked few recipes from weekend and weekday dishes,the dishes were mouth watering.Buy the book and once try the recipes and enjoy. Very useful cook Book.. I purchased this book before 10 days and I fell very happy when I read all the dishes.I am staying in Mumbai with my family members.I cooked few recipes and the dishes were very delicious. Recommend to buy the book,this will help you a lot in your kitchen. Recently I purchased the cook book and I am very happy that I got such a nice book.Very nice collection of interesting and delicious recipes are there in this book.I prepared some dishes from refreshment and dinner dishes and all dishes made mouth watering.Recommend to buy the book and try all recipes. This is a very good Cook Book.I bought the book recently and I am staying in Punjab with my family.We all in our family love to eat new new dishes everyday,so I bought this book when I saw on Pothi. I have cooked 4 dinner and 5 weekend dishes dishes and the dishes were yummy. I am very happy by having this cook book. Cook Book is Fantastic.This book has a good collection of tasty and delicious recipes.I am a working in a software company in Gurgaon and recently purchased the book.I also cooked 4 dishes from dinner and weekend dishes for a small party and all praised a lot by eating the recipes.Buy,cook and enjoy the recipes. I am a Hotel Management student and staying in Indore with my parents and cooking is not only my profession but also my passion. When I saw so many good reviews about this book on Pothi I purchased the book and I have cooked 6 recipes from weekend dishes and all appreciated a lot. I purchased this book before 10 days and this book is helping me a lot in kitchen,I also prepared 5 dishes from weekday and 4 dishes from dinner recipes and all the dishes were very tasty.I like the blog also.I suggest to buy the book.